Super came in initially from the Orlando Race Track. She also raced at Derby Lane and at Melbourne. She retired in May of 2015. She raced 60 races and won a few of those. She raced at 64lbs. Super is a very friendly girl. She passed her small dog and cat test and lived with cats, small dogs and kids in her first home. She is being re-homed because she seemed stressed by all the dogs, kids and activity in her very busy home. Neighbors of her previous family fell in love with Super and are adopting her. 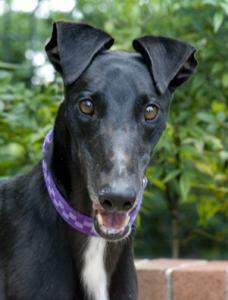 Super is a shiny, black girl with cute, floppy ears. She travels really well, just hops in the van and lays down and doesn't get up. Her sire is Kiowa WW Brother and her dam is Express Mail. Super was a little bit accident prone at the track. She got a gash on her inner thigh that healed up fine but there is a scar there. Not long after that healed, she got her tail partially amputated in another accident. So she has a tail that is shorter than usual. Everything is healed up and she is fine now. She may be accident prone but she is a gorgeous girl that is very calm and friendly. She is a very smart girl that is a bit of a houdini. She figured out how to get out of a regular metal crate so will need a more secure airline approved vari kennel (the plastic type). Super is a sensitive girl that does best in a quiet home.